No plan. That’s kind of how the week went. I failed to plan out my week on my big piece of Kraft paper that is pinned to my easel (yes at one time I wanted to paint, still do, but ….) as I had started to do in the weeks prior to this one. But it was a great week none the less. It started off with a visit from my brother, who was travelling through on his way to work up near Grande Prairie. My parents decided to come out and we all convened at our place for some good old visiting and catching up. I am not great on the phone or other electronic media, so in person visits are my favorite! Not sure what happened to Wednesday, but on Thursday Don and I traveled to the city for a variety of medical appointments and to take in the 16th Annual Bentley Lecture in Sustainable Agriculture (http://www.rr.ualberta.ca/SeminarsandLectures/BentleyLecture.aspx). It was presented by Dr. Jennifer Clapp of University of Waterloo. Outstanding is the only word that is describes it. If you have any interest in food or pretty much any agriculture system, you should watch the replay of her lecture at: http://reelmensch.com/livestream/. 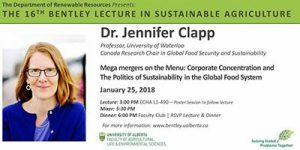 An all -round excellent speaker, Dr. Clapp walked us through the why’s and how’s of the recent or pending mergers of some of the “Big 6” agri-products companies, Dow+Dupont, ChemChina+Syngenta, and Bayer+Monsanto. She also covered the arguments of both sides of the issue and their concerns/positions on how we need to proceed to feed the world. You can probably imagine which side I am on. It is shocking, but not surprising to learn that the national competition bureaus which adjudicate on whether or not these mergers should proceed only consider financial implications, sustainability and environment do not come into their analyses. I was encouraged to hear that in Europe the outcry over one of these mergers resulted in 10’s of thousands of letters and emails to one of the commissioners of such a bureau, which prompted a written response from the commissioner emphasizing that their mandate does not currently include sustainability or environmental implications analyses. Apparently this has never happened before! Never under-estimate how important your letter to your government or to other agencies is, it opens ears which is the first step to critical policy changes. Also, be sure to hang on until the questions when a gentleman from India points out that no one seems to remember that water is ultimately a finite resource and is never considered in our equations about how much food we can produce. I am hopeful and so thankful that that intelligent, eloquent women like Dr. Clapp are studying these issues and spreading knowledge to all of us, from which we can act in whatever way we can. Please watch the lecture, you will come away a more informed consumer and citizen. Friday I was pretty much brain fried after the white knuckle drive home Thursday evening in the white out conditions. I soothed my frazzled synapses by evaluating the condition of my stored dahlia tubers and planting up some forgotten Muscari for forcing. This year I am trialing 4 different methods of tuber storage. 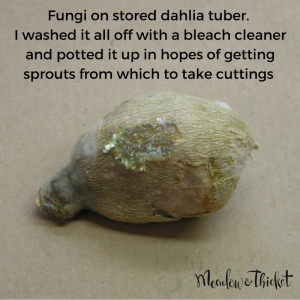 In the past I have tried the method where you divide in the fall, “sterilize” the tubers to the extent possible, and then store them for the winter in a plastic baggie filled with wood chips. I failed miserably. All my tubers either dried out or molded. Since then I have stored them the old fashioned farm way, by digging the clump in the fall, leaving as much soil on the clump as possible, letting it dry out thoroughly (about 10 days in the garage* recall that I live in north west Alberta, a very arid, low humidity area, so drying in the garage is easy) and then storing for the winter in the garage/shop where the temperatures stay above 0 C but never above 10 C, all winter. However, in 2017 I grew over 200 dahlias, and I simply do not have the storage space to overwinter that many clumps. Thus, I had to revisit tuber storage options. I tried five options, in addition to the clump method, this fall. All involved rinsing, dividing and finally washing the divided tubers in a dilute bleach solution, followed by 24-48 hours to dry slightly after all that washing. What varied from treatment to treatment was the storage packaging. The storage environment for all the treatments was the same: all tubers and clumps were stored in my “dahlia storage room”, a room in the barn that my husband built in order to reclaim his garage over the winter (I had expanded to taking up both bays of the garage and this was too much!). The room is actually the tack/feed room in the barn, which he insulated heavily. We have a small heater on a thermostat which comes on to ensure the room stays in the range of 3.8 to 4.8 C. The humidity in the room is not controlled, but because it is so well insulated and pretty well sealed, the relative humidity has drifted down from the 70’s when the tubers first went in, to its current 53%. 3) Individual tubers wrapped in saran wrap. 5) Individual tubers packed in slightly moist peat mix in 10-20 trays (therefore only 2 layers of tubers) the layers separated by newsprint and the tray covered with a layer of newsprint. 6) The tried and true method of a clump stored with its soil intact around it, dusted with sulfur powder to control fungal growth, exposed to atmosphere. I know I shouldn’t bias the study by praying for the success of the paper bag treatment, but I really would love to get away from the plastics, so praying I am. So, now to results. A few of the tubers in Treatment 1 showed some fungal growth, but for the most part these tubers were holding their own. All the paper bag treatments (Treatment 2) were holding their own, with no fungal growth, but some desiccation had occurred, so I rolled the bags up tighter and placed them in some of the closed cardboard boxes (Treatment 4) to try to hold in whatever bit of moisture was left, but without having to add water. At least 50% of the saran wrapped ones were rotted/molded. The tubers in the 10-20’s looked okay, no moud, but I didn’t dig through all of them. The ones in the top layers of the cardboard box treatments also looked great. The clumps were all looking fine, no desiccation evident. However, we won’t really know about treatments 5 and 6 until I pull out all the tubers in March to start the sprouting process. For tubers that had only a little bit of mold on them, I sprayed the moldy area with some bleach cleaner and set them to dry overnight, to be returned to the storage room for the rest of the storage period. For tubers with substantial mold, but that I thought were salvageable, I cut off the part of the tubers with the mold , if the mold was on the neck or sprouts, I sprayed it with a bleach cleaner and then potted them up, in the hopes that I can treat them as pot tubers, and collect cuttings to propagate from. I have placed these potted up tubers on heat mats under lights. For tubers that were beyond recognition – off to the compost they went. I am excited to say that 31 of the 50 lisianthus seeds planted have germinated and the tiny, barely 2 mm long, delicate, hair-like sprouts are starting to reach up. They are almost impossible to see, and are very fragile at this point. I check on them multiple times per day to ensure the moisture in their soil blocks is appropriate. I didn’t mention this last week, but when I prepared the soil block mixture for the lisi’s and the other perennial seeds, I used some of my fresh vermicompost straight from my worm compost bin, instead of using bought compost. The reason for this is that I thought I had a bag of compost in the house, but it turns out I didn’t and my bags outside were frozen solid so I couldn’t use them. 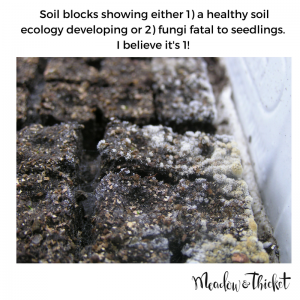 Well, I believe it is the use of this fresh vermicompost which has resulted in some very interesting fungal growth on the edges and surfaces of the soil blocks! And it smells just like mushrooms when I mist it. I know the unique and characteristic fragrance of healthy soil is attributed to Actinomycetes sp., but my soil blocks are emitting a very different perfume, it is a distinct, yummy, fresh mushroom-y-smell. Can’t say I have ever smelled this from any of my trays before. Now usually one would be panicked by fungal growth, as this likely means your seedlings are going to succumb to damping off, however I have been growing more and more skeptical of the whole “sterilized media” bandwagon. I water with snow or rain water which carries various ions and is definitely not sterile having made its way through the atmosphere down to the ground where I collect it. I add compost to my soil block mix, and compost is the antithesis of sterile. All organic growers know that a thriving, biologically active soil is the best for your plants, so I have been asking, why are my shorts in a knot over purchasing/using “sterile media” when I promptly inoculate it when I prepare my blocks? I have decided to watch what happens. I have been removing the humidity dome from the soil blocks during the day and misting them lightly once or twice over the course of the day. I then bottom water them in the evening and put the humidity dome back on them, with a portion of it off the tray to allow some ventilation. Well, its been 3 days since the first seedlings of the lisi’s have emerged and so far they haven’t damped off, despite being surrounded by the various fungi. Knock on wood and I will keep you posted. Again, I admit to praying for the success of the lisi’s AND the fungi. Nothing would make me happier than to have a thriving mini soil ecosystem in my soil blocks and no damping off! 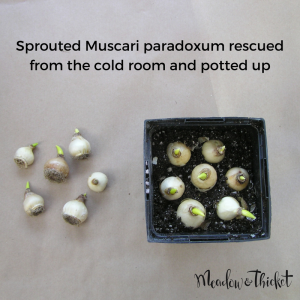 In the fall after planting my 2,000 tulip bulbs, along with some other miscellaneous bulbs just for the ornamental beds, I saved several Muscari paradoxum bulbs to try forcing this winter. I am embarrassed to say that I did not pot them up immediately, as one should. Instead they sat in their packages at the back of a cool room in our basement until I was digging about looking for some other seeds and I found them this week. I felt just awful, as several of them had already started to sprout. I am one of those people who can’t stand seeing abused plants, so seeing these poor bulbs trying to participate in life while hidden away in a dark room due to my forgetfulness makes me cringe. I promptly pulled them out and potted the poor things up and put them under lights in my very cool sun room. I am hoping they recover from the months of neglect. I will keep you posted. Well, not much new on this front. The Rudbeckia triloba that were up as of the last report are growing really well, as are the Baptisias. The one Perovskia is bulking up a bit as are the two Maralroot seedlings. I have one new yellow wild indigo up in the soil blocks, but other than that not much change in the perennials. There are several active Garden Clubs in the communities around us. The SanGudo and District Horticulture Club is one, and each year for the last 11 years they have organized the most fabulous day for all of us Zone 2 Gardeners, at the time of year when we are all just desperate to get back into the soil! Their Garden Day is a whole day of talks on gardening related topics, accompanied by displays by local merchants and a silent auction to raise funds to continue this great initiative. Over 100 of us gathered at the San Gudo Community School bright and early Saturday and took in the information-packed and most entertaining talks by Morgan Webb, seed analyst in his own seed company and horticulturist at Greenland Garden Center in Edmonton (http://www.greenlandgarden.com/). Morgan gave us innumerable tips as he made his way through his talk on “Zone Envy: Hardiness Zones and Rural Gardeners”. 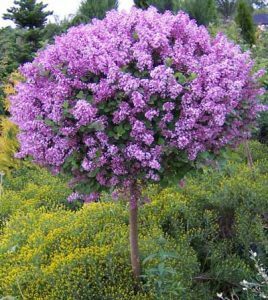 I was really encouraged by so many things he said, but particularly so when he assured us we could have shrubs on standards even out here, with Dwarf Korean Lilac being particularly hardy for this type of use. Another tidbit that brought glee to my heart was that a gardener or two in Edmonton are actually growing Wisteria!! They take the vines down and bury them in mulch each winter. I am definitely trying that- he recommended Blue Moon if one was going to try a wisteria here. 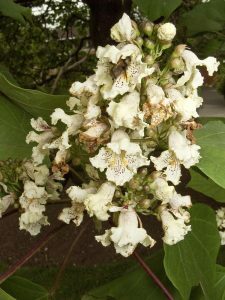 Another plant that he spoke about, which none of us had heard of before, was the small tree, Chinese Catalpa (Catalpa ovata). Apparently it can grow to 15 ft high, has huge broad leaves making it look slightly tropical, and orchid like flowers! Apparently it can survive Zone 2, but takes 3-5 years to get established, and looks kind of ratty until it gets going, so you need to be patient with it, but my goodness, based on Morgan’s photos it is surely worth it. He wrapped up his talk on tried and true perennials under the category “Gardening like Granny”. 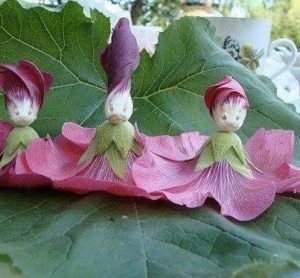 Hollyhocks are one of these, and he showed this picture from Pinterest of hollyhock dolls. I had never seen such a thing before, but apparently it is an old fashioned craft. I will definitely be doing this this summer when my grandaughter visits. After a delicious lunch of lasagna (3 kinds!) baked up by the local Connections Coffee House (https://connectionscoffeehouse.com/), Koen and Inge DeHerdt of DeHerdt Gardens (https://www.deherdtgardens.com/) gave us an overview of some new and interesting plants we may want to try and tips on an organic fertilizer that they have switched their whole operation over to. It was a great day and I am so thankful that the members of the Sangudo club go to all the work of putting this on. Well, that’s about it for this week, now I have to get busy and write up my schedule for this one! Have a great week.